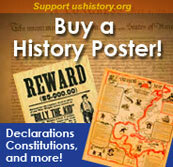 When he became President upon Franklin D. Roosevelt's death in 1945, few believed in Harry Truman's ability to govern. But it was Truman's common sense approach that helped the U.S. end World War II and move on to tackle postwar challenges. When Japan surrendered to the Allies at the end of the long summer of 1945, Americans were ecstatic. Ticker tape parades were staged in nearly every town to welcome America's returning heroes. Unquestionably, the United States entry in World War II made the difference for the Allied cause. The American army and navy were now the most powerful in the world. Even those who did not fight could feel proud of the work Americans did in the factories to build the war machine. The youth of America would never forget the sacrifices of wartime. From rationing food to collecting scrap to buying bonds to fighting in battle, the efforts to defeat the Axis were a product of the collective American will. News anchor, Tom Brokaw, recently labeled the Americans who came of age in World War II the "greatest generation." 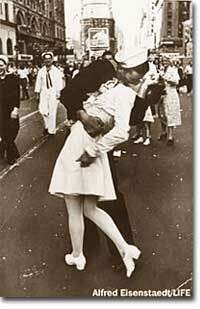 The euphoria that swept the nation in 1945 was captured on film by Life magazine photographer Alfred Eisenstaedt. This memorable image of a sailor kissing a nurse in Times Square continues to be a defining image of WWII. Unfortunately, the euphoria could not last long. Although the Soviet Union and the United States were allied in their struggle against Hitler's Germany, Americans distrusted Josef Stalin's Communist government and abhorred his takeover of Eastern European countries immediately after the war. More Soviet citizens were killed in World War II than any other nation, and Josef Stalin was determined to receive compensation for damages and guarantees that such a slaughter could never again plague the Soviet people. For its part, the United States was unwilling to sit idle while another form of totalitarianism spread westward from Moscow. One war immediately begat another — the Cold War. No theater of the globe was free from Cold War struggle. From Eastern Europe to China and Korea, the Truman Administration was beset with the challenge of halting the advance of communism. As the wave of decolonization washed through the southern part of the globe, each new nation would be courted by the superpowers. The independence of Israel in 1948 had Cold War implications in the Middle East. Within five years of the end of World War II, American troops were summoned to South Korea to halt the advancing communist forces of the North. The American military prepared for the Cold War by conducting tests with new atomic and nuclear technology. 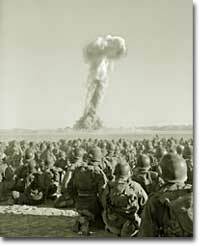 Here, troops watch radioactive smoke during the "Desert Rock" exercise in 1951. No single foreign policy issue mattered more to the United States for the next 50 years as much as the Cold War. President Truman set the direction for the next eight presidents with the announcement of the containment policy. Crises in Berlin, China, and Korea forced Truman to back his words with actions. The Cold War kept defense industries humming and ultimately proved the limits of American power in Vietnam. Democracy was tested with outbreaks of Communist witch hunts. Although the United States would emerge triumphant in the Cold War, the last half of the 1940s was marked by an uncertainty that soured the sweet taste of victory in World War II. A "20th century Ivan the Terrible" or a "Towering genius of humanity?" Joseph Stalin, both great and terrible, walked away from WWII a victor and marched right up against Harry Truman as the Cold War began.